All citizens of the state benefit from a balanced supply of housing which is affordable to persons and families of low and moderate income. Establishment. 3 Existing affordable housing shortage creates negative impacts for the state including barriers to the expansion of the states labor force, adversely affects the ability of communities to host new businesses. 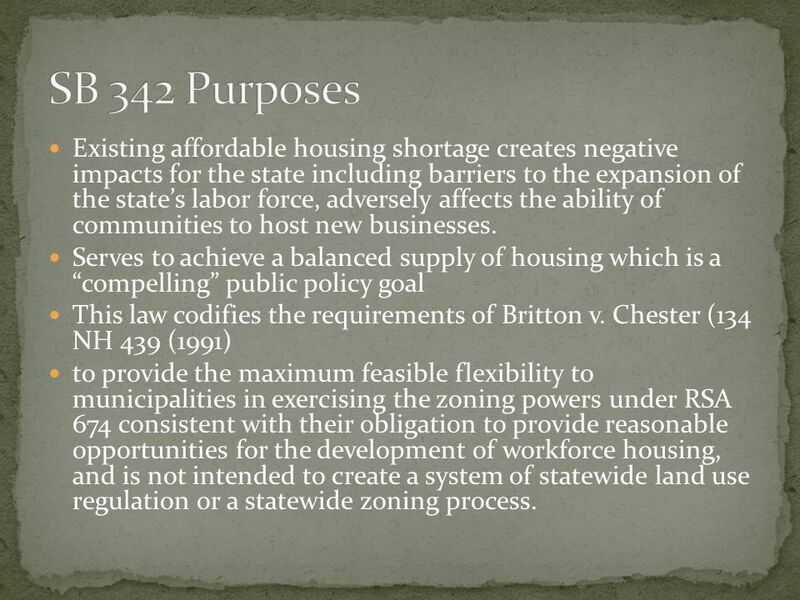 Serves to achieve a balanced supply of housing which is a compelling public policy goal This law codifies the requirements of Britton v. Chester (134 NH 439 (1991) to provide the maximum feasible flexibility to municipalities in exercising the zoning powers under RSA 674 consistent with their obligation to provide reasonable opportunities for the development of workforce housing, and is not intended to create a system of statewide land use regulation or a statewide zoning process. 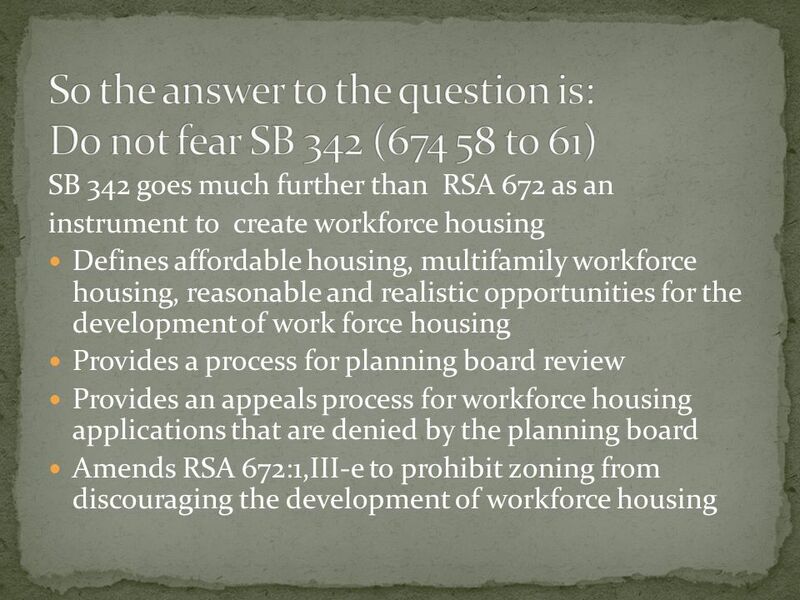 6 Reasonable and realistic opportunities for the development of workforce housing means opportunities to develop economically viable workforce housing within the framework of a municipalitys ordinances and regulations adopted pursuant to this chapter and consistent with RSA 672:1, III-e. 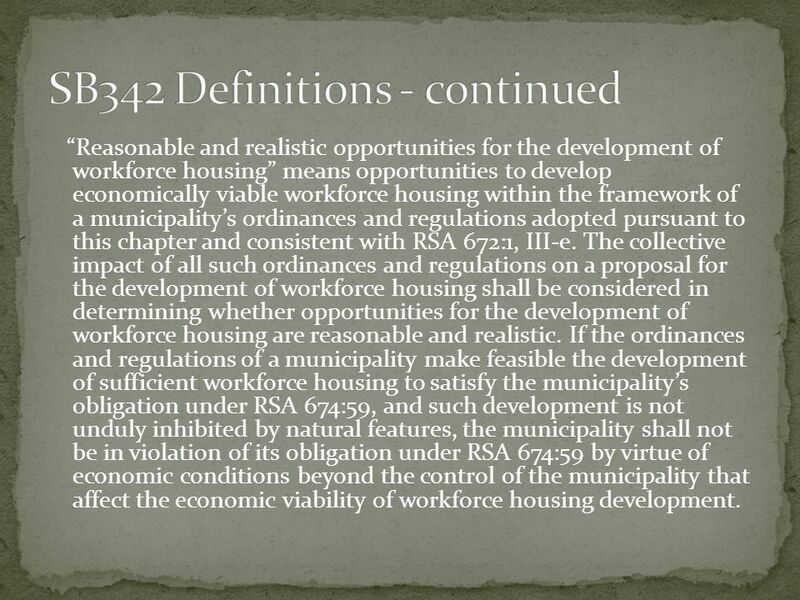 The collective impact of all such ordinances and regulations on a proposal for the development of workforce housing shall be considered in determining whether opportunities for the development of workforce housing are reasonable and realistic. 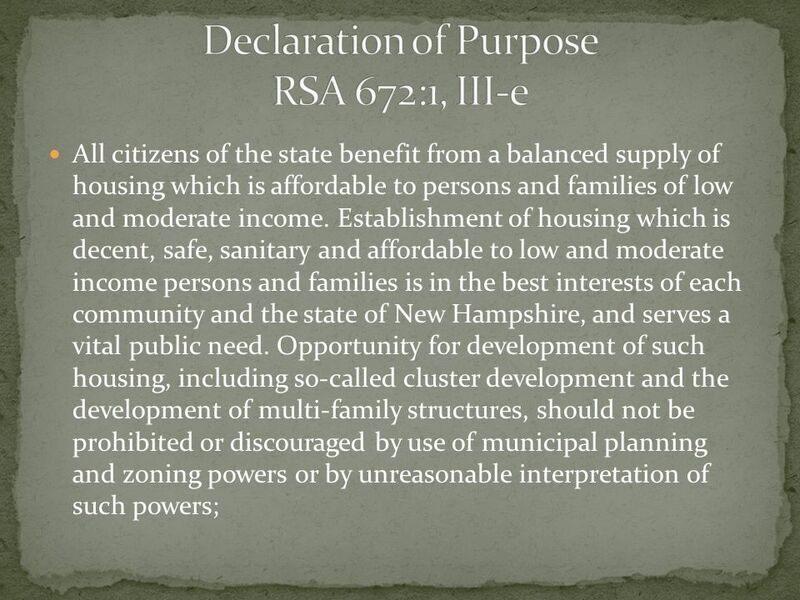 If the ordinances and regulations of a municipality make feasible the development of sufficient workforce housing to satisfy the municipalitys obligation under RSA 674:59, and such development is not unduly inhibited by natural features, the municipality shall not be in violation of its obligation under RSA 674:59 by virtue of economic conditions beyond the control of the municipality that affect the economic viability of workforce housing development. 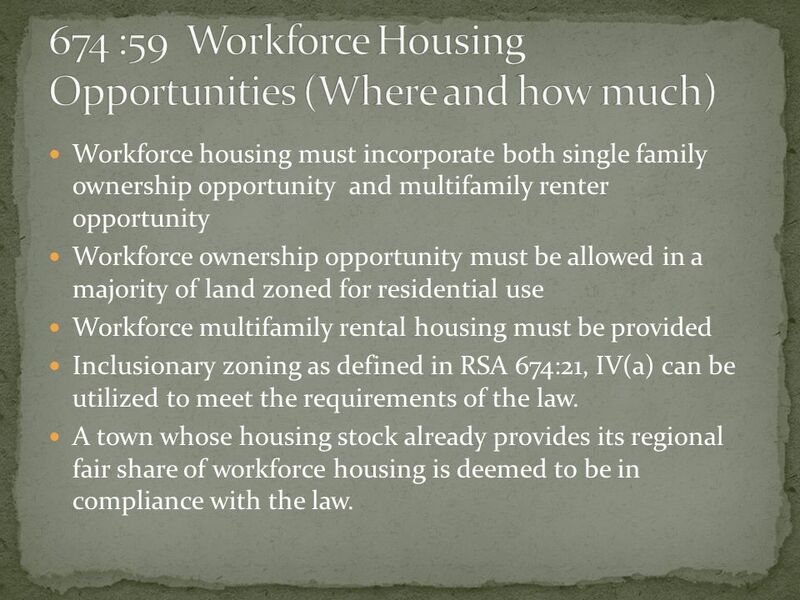 7 Workforce housing must incorporate both single family ownership opportunity and multifamily renter opportunity Workforce ownership opportunity must be allowed in a majority of land zoned for residential use Workforce multifamily rental housing must be provided Inclusionary zoning as defined in RSA 674:21, IV(a) can be utilized to meet the requirements of the law. A town whose housing stock already provides its regional fair share of workforce housing is deemed to be in compliance with the law. 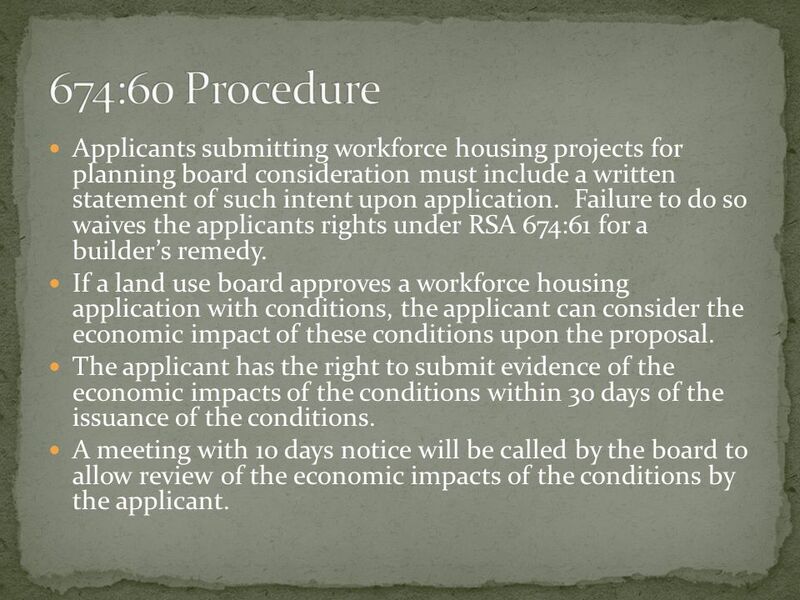 8 Applicants submitting workforce housing projects for planning board consideration must include a written statement of such intent upon application. Failure to do so waives the applicants rights under RSA 674:61 for a builders remedy. If a land use board approves a workforce housing application with conditions, the applicant can consider the economic impact of these conditions upon the proposal. The applicant has the right to submit evidence of the economic impacts of the conditions within 30 days of the issuance of the conditions. A meeting with 10 days notice will be called by the board to allow review of the economic impacts of the conditions by the applicant. 9 The results of this discussion may result in altering rescinding or affirming any or all of the conditions or restrictions of approval. 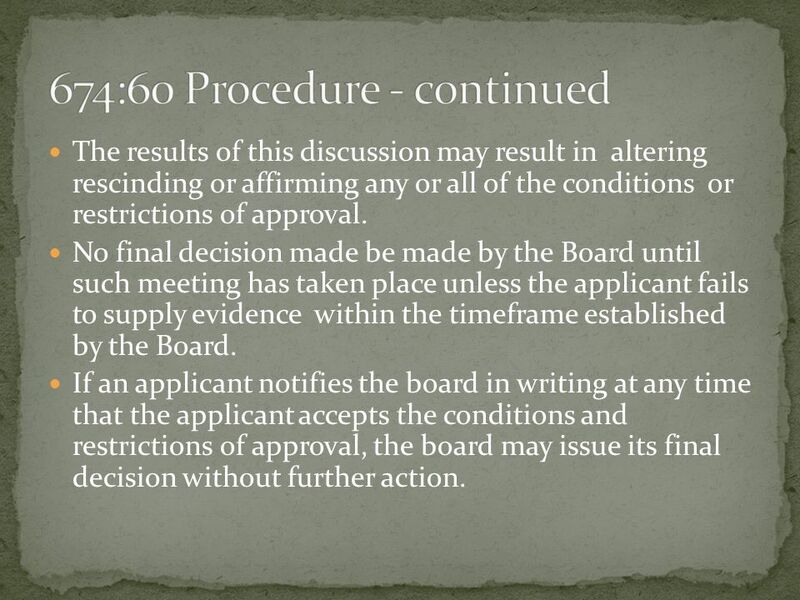 No final decision made be made by the Board until such meeting has taken place unless the applicant fails to supply evidence within the timeframe established by the Board. If an applicant notifies the board in writing at any time that the applicant accepts the conditions and restrictions of approval, the board may issue its final decision without further action. 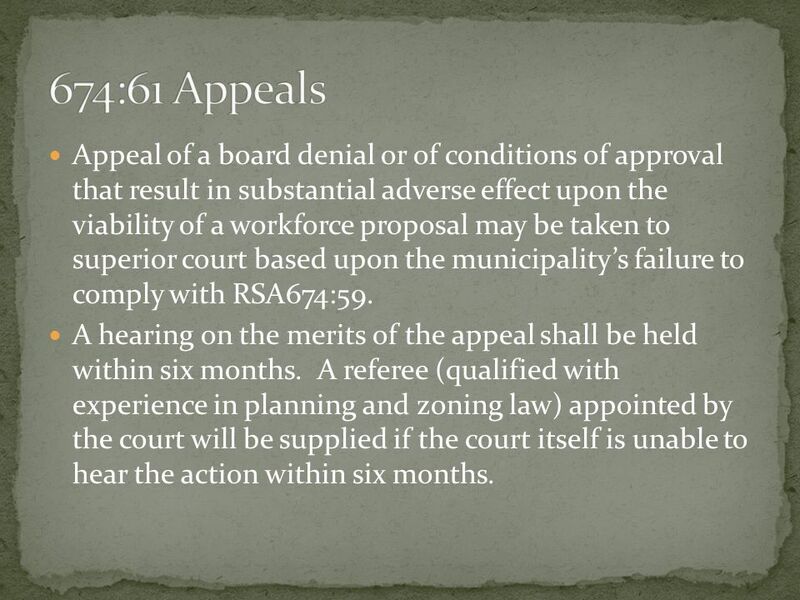 10 Appeal of a board denial or of conditions of approval that result in substantial adverse effect upon the viability of a workforce proposal may be taken to superior court based upon the municipalitys failure to comply with RSA674:59. A hearing on the merits of the appeal shall be held within six months. A referee (qualified with experience in planning and zoning law) appointed by the court will be supplied if the court itself is unable to hear the action within six months. 11 In the event the decision of the court or referee grants the petitioner a judgment that allows construction of the proposed development or otherwise orders that the proposed development may proceed despite its nonconformance with local regulations, conditions, or restrictions, the court or referee shall direct the parties to negotiate in good faith over assurances that the project will be maintained for the long term as workforce housing. 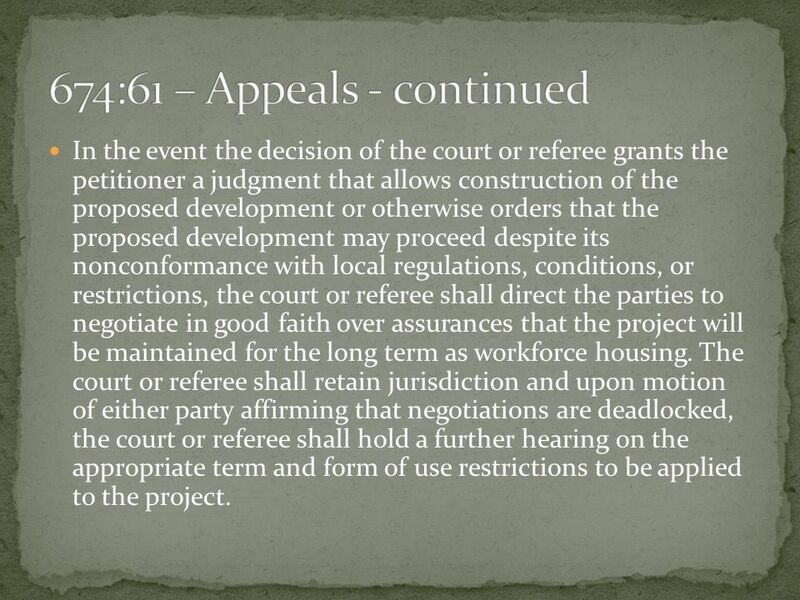 The court or referee shall retain jurisdiction and upon motion of either party affirming that negotiations are deadlocked, the court or referee shall hold a further hearing on the appropriate term and form of use restrictions to be applied to the project. 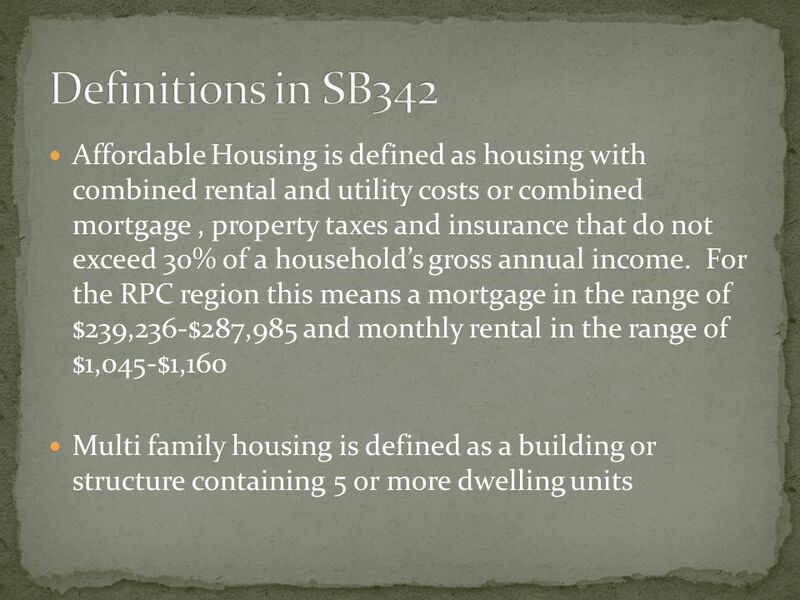 Download ppt "All citizens of the state benefit from a balanced supply of housing which is affordable to persons and families of low and moderate income. Establishment." Board of County Commissioners PUBLIC HEARING December 2, 2008. Issues for Council Discussion April 24, Critical Habitat Changes made to Chapter II, IV and V in response to comments received, and experience gained. S.L Part 1, Section 3. (b) G.S. 150B-21.3A: PERIODIC REVIEW AND EXPIRATION OF EXISTING RULES. Contract and Grant Provisions and Administration Section 105 (Page 30) Title I The Act. Board of County Commissioners PUBLIC HEARING October 28, 2008. The First-tier Tribunal (Property Chamber) Nicholas Kissen Thomas Frith Islington Leaseholders Association 12 th June 2013. 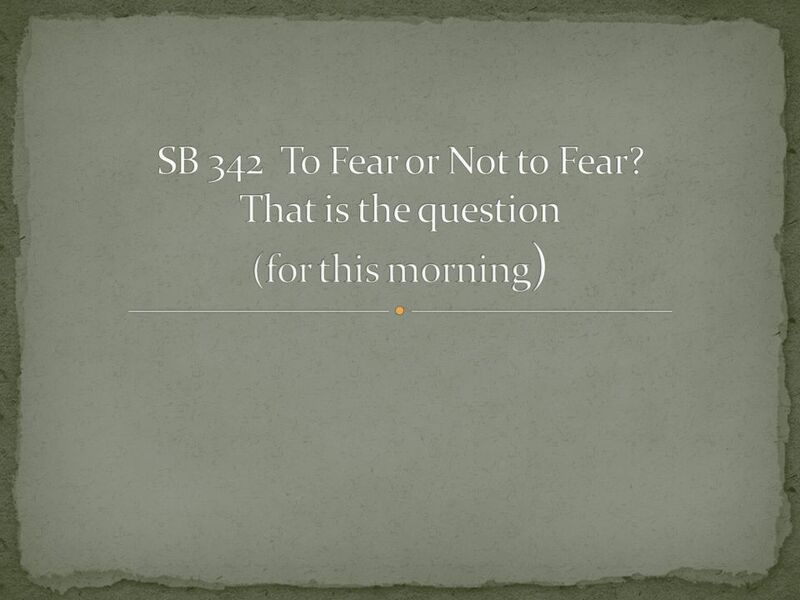 Article XXXVI – Signature, ratification, acceptance, approval or accession 1. – This Protocol shall be open for signature in Berlin on 9 March 2012 by. 1 May 9, 2014 Nancy S. McNayr, AICP McNayr Paque, LLC Oklahoma Municipal League Oklahoma Municipal League Planning Commissioner Workshop Practical Advice. Advocating for Persons with Disabilities as a Housing Priority: Discussion of Proactive Ways to Providing Accessible Housing Presented by Barbara Chandler. OVERVIEW OF CHAPTER 40B FUNDAMENTALS The Next Chapter of 40B: A Training on the Latest Developments in the Affordable Housing Law Fall 2011 Presented by. Limited Self-Governance Act Limited Self-Governance Act Act No , “The Alabama Limited Self-Governance Act,” became law on May 26, 2005 Is not. What Can Local Government Do?. Utah Agriculture Code 4-1-8(1) “the science and art of the production of plants and animals useful to man including the. Town of Lyndon Zoning Bylaw Changes Town Planning Commission Public Informational Meeting 09December09. LOCAL REGULATION AND CLIMATE CHANGE QUICK TELECONFERENCE American Bar Association Section of Environment, Energy, and Resources Climate Change, Sustainable. THE ABCs OF CRAs THE PLAN CHAPTER 163 REQUIREMENTS. Legislative Rule-Making Process. Three Different Processes Higher Education 29A-3A-1 et seq State Board of Education 29A-3B-1 et seq All other state agencies. Area Commissions Purpose Area commissions are established to afford additional voluntary citizen participation in decision-making in an advisory.